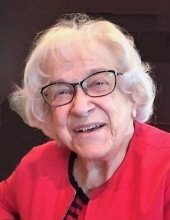 Arlene Edith Luchsinger, 81, of Terre Haute passed away January 23, 2019 in Indianapolis, IN after a short illness. She was an academic librarian for 50 years before retiring as Assistant Director for Branch Libraries, and Head, Science Library at the University of Georgia Libraries in 1997. Arlene was born May 7, 1937 in Elkhart, Kansas to Orval Jefferson Abel and Lucille Edith Byarlay Abel, the oldest of their three children. Survivors include one daughter, Caroline L. Gilson and her husband Jim of Terre Haute; one grandson, Broz Hamilton Gilson; sister and brother-in-law Martha and Hrant Avedissian of Kerrville, TX; sister-in-law, Karen Abel of St. Louis, MO; and three nephews and one niece. She is also survived by close personal friend, Ed Price of Terre Haute. In addition to her parents, she was preceded in death by her brother, Neil Meier Abel. Arlene was a 1955 graduate of Clay County Community High School, Clay Center KS. She earned a B.A. in botany from the University of Kansas in 1958. She earned a M.S. in botany from Kansas State University in 1963, and a Masters in Library Science from the University of Michigan in 1965. She taught biology and chemistry before pursuing a career in librarianship. She worked as an academic librarian at the University of the South (Sewanee TN), Georgia State University (Atlanta, GA) and the University of Georgia (Athens, GA). She visited over 70 countries in all continents except Antarctica before moving to Terre Haute, Indiana in 2003. As a professional librarian, she was active in the Georgia Library Association and the American Library Association. She wrote numerous essays, book reviews and articles for both agricultural and professional academic library publications. She was the co-author of Smith's Guide to the Literature of the Life Sciences with R.C Smith and W.M. Reid (1980). She was also the co-author of Plant Systematics with Dr. Sam Jones (1979, 2nd edition 1986). In Terre Haute, she was a member of DAR (Fort Harrison Chapter) and active with groups including 100 Women Who Care and the Swope Art Museum. She was also involved in community and civic groups in Athens, GA and Milwaukee, WI. She enjoyed maintaining friendships with former high school classmates, friends and work colleagues. She was a member of Sigma Kappa sorority and Immanuel Evangelical Lutheran Church, Terre Haute. She was passionate about genealogy and keeping current on world and local events. She was a skilled quilter and an excellent bridge player. She was a professional and personal mentor to many in their life's journey and found true love at the end of her life. A great source of pride was her grandson. She had a winning smile and a fabulous laugh. A celebration of life for Arlene will be held at a later date. Burial in Clay Center KS is planned. The family suggests memorial donations to the Clay County Museum, Clay Center KS or to the Vigo County Education Foundation, Terre Haute IN. Arrangements are under the direction of Callahan & Hughes Funeral Home, 605 South 25th Street, www.callahanandhughes.com. To send flowers or a remembrance gift to the family of Arlene Edith Luchsinger, please visit our Tribute Store. "Email Address" would like to share the life celebration of Arlene Edith Luchsinger. Click on the "link" to go to share a favorite memory or leave a condolence message for the family.